Cloud computing eliminates the need for individual companies to buy, deploy and maintain IT infrastructure or application software. In the cloud computing model (also known as software-as-a- service, or SaaS), the vendor takes responsibility for deploying and managing the infrastructure (servers, operating system software, databases, data center space, network access, power and cooling, etc.) and processes (infrastructure patches/upgrades, application patches/upgrades, backups, etc.) required to run and manage the full solution. Because cloud vendors manage all of their customers on a single instance of the software, they can amortize infrastructure-related costs over thousands of customers. This results in substantial economies of scale and skill, reducing the total cost of ownership (TCO) for customers who deploy business management solutions. The overall TCO for NetSuite’s ERP and CRM cloud solution is as much as 46% less over four years for a 100-user implementation than comparable on-premises mid-market ERP and CRM solutions. 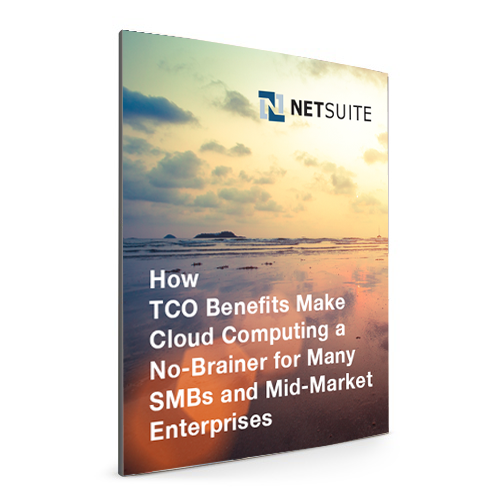 Cloud solution cost advantages are significant across all deployment sizes we evaluated, but taper somewhat as the number of users increases: For 50 users (23 ERP and CRM users, and 49 CRM users), NetSuite’s TCO is 51% less than TCO for on-premises solutions. For deployments with 200 users (48 ERP and CRM users, and 185 CRM users), the TCO advantage declines to 31% for NetSuite’s cloud offering. Application software costs (subscription and support fees) account for roughly 85% of the total solution cost in the cloud model (Figure 1). In the on-premises model, application software costs (including the upfront license fees and annual maintenance fees) constitute just 23% of the total solution cost. Customers do not incur any direct IT infrastructure and related management costs with the cloud model because subscription fees encompass these costs. In the on-premises ERP and CRM deployments, IT infrastructure (hardware, software, maintenance and ongoing management of the infrastructure) costs range from 51% (for the 50-user scenario) to 45% (for the 200-user scenario) of the total solution cost over four years (Figure 6). This category accounts for the biggest difference between the TCOs of the two models. Sometimes it seems like small and medium businesses (SMBs) and mid-market enterprises can’t catch a break. Even before the recession struck, many were struggling to compete in increasingly competitive and demanding business environments. Keeping up with these demands and trends— from fast-evolving technologies to changing customer expectations to new, sometimes global, competition—made life increasingly challenging for SMBs. Then the recent global recession hit hard, and in many cases, limited resources and reserves made it tough for SMBs to bounce back. Even as we emerge from the recession, these ongoing pressures and fiscal uncertainties continue to weigh on SMBs. Consequently, TCO is a top consideration when evaluating potential business application options. The good news is that cloud computing has come of age, and is providing SMBs with access to computing resources and capabilities that were once out of reach. More businesses are determining that cloud-based services, especially SaaS application offerings, can provide SMBs with more powerful and capable solutions while decreasing capital outlays and operational costs. In this study, we begin with a brief overview of current SMB requirements and challenges. Next we examine how the cost and operational benefits delivered by cloud-based business application solutions have propelled these solutions into mainstream business and technology practices. Then we compare the TCO for planning and design, infrastructure hardware, software and support, application software, deployment and training costs of traditional on-premises business applications versus cloud business applications offered by NetSuite, a leading cloud solution vendor. We conclude with our recommendations for SMB customers who are evaluating these alternative computing models. offer the potential for SMBs to operate more efficiently and effectively, but also create new expectations that can be difficult to fulfill. Today’s customers frequently expect every business— regardless of size—to deliver “big-company” service, responsiveness and sophistication. Regulators require ever-more-exhaustive and precise record keeping. The Internet and mobile computing make it much easier for competitors based in other states or even other countries to encroach on local markets that a business once had all to itself. Consequently, many SMBs have come to the painful realization that their existing IT systems and processes aren’t capable of meeting today’s requirements. They are all too aware that using simple accounting packages and unruly collections of Excel spreadsheets for financials and other core business operations hampers growth and even jeopardizes survival in today’s challenging environment. For example, Cover-All Technologies, Inc. had been using Great Plains accounting software in its finance department, Sage ACT! software for its sales and marketing, and a third package for managing its services operations. “We weren’t able to consolidate any of our information efficiently, and were doing lots of tasks on spreadsheets,” recalls Ann Massey, secretary, controller and chief financial officer at the Morristown, NJ-based company, which provides software and solutions for the property and casualty insurance industry. Making matters worse, she says, was the fact that Cover- All would soon need to comply with the pending Sarbanes-Oxley (SOX) accounting regulations. Or take the case of Calico Energy Services, a Bellevue, WA-based software vendor for Smart Grid data and energy management. Calico, had been using QuickBooks and Excel workbooks for financial accounting and reporting. “Excel workbooks are fraught with problems,” says Kelly Suter, vice president of finance and accounting. “They’re static, not really interactive and their formulas can contain errors that are difficult to identify.” Further complicating the problem, Calico Energy only has three full-time IT employees. The scarcity of IT resources is more the norm than the exception for SMBs. Small businesses with 50 to 100 employees are often lucky to have just one full-time person—typically an IT generalist—to support a complex array of IT resources and users. In mid-market businesses (100 to 999 employees), IT staffing grows, averaging about one full-time IT person for every 100 employees. But business and IT complexity often outstrip the growth of IT resources, especially in mid-market firms, which face the complexities of managing several locations, multiple servers, an expanding array of desktops and devices, and a more mobile workforce. Reacting to daily application availability, maintenance and support issues can max out IT, leaving little time to deploy new solutions or even to update existing ones. As a result, SMBs often face a similar dilemma. To remain competitive, they need solutions that give them more powerful operational capabilities—but they have limited time, expertise and money to earmark for the job. During the past several years, cloud computing in general—and SaaS in particular—has moved from the fringes to the mainstream of business practice for SMBs and mid-market enterprises. Cloud computing shifts the IT burden from the customer to the cloud computing application vendor, which provides Web-based access to applications as a service through a subscription pricing model. This eliminates the need for customers to buy, deploy and manage IT infrastructure and solutions. Cloud vendors take responsibility for everything: the servers, storage, operating system, database, business software, updates, migration, power and cooling, data center space and support services. This approach can deliver operational, technical and business benefits to SMBs and mid-market enterprises (Figure 2). Cloud vendors can provide these benefits because they’ve built their solutions as Web-based services from the ground up. Instead of building their solutions to run in-house as separate, individual instances for each customer, cloud vendors design their solutions as a one-to- many, or multi-tenant, model. This enables them to run thousands of customers on a single instance of the database and application software. By optimizing their solutions for this shared environment, they can achieve efficiencies throughout the solution lifecycle that would be difficult for on-premises vendors to achieve. As illustrated, the cloud model has enabled Calico Energy Services, Cover-All Technologies and many other customers not only to ease IT costs and burdens, but also to gain operational capabilities that provide considerable business value. SECTION 3. WHY DOES TCO MATTER? In the IT industry, TCO represents the total cost of purchasing (or in the case of cloud computing, subscribing to) and operating a technology solution over its useful life. TCO provides a realistic and holistic measure of the long-term costs required to acquire and operate technology solutions. Return on investment (ROI) is another method commonly used to evaluate and prioritize technology investments in a company. This measure is typically used to compare investments that uncover new top-line revenue and growth opportunities. However, ROI tends to be more subjective in nature than TCO because ROI looks at business benefits, which often cannot be measured as accurately or objectively as costs. SMB Group views TCO as a preferred method to compare technology investments when two solutions provide roughly equivalent benefits over the solution lifecycle, but have different types of costs associated with acquisition, maintenance and operation. For these reasons, a TCO evaluation typically offers a more tangible assessment of the total costs involved in deploying cloud-based applications compared to on-premises business solutions. SECTION 4. WHAT DOES THIS TCO MODEL INCLUDE? The TCO model used in this study compares functionally similar cloud and on-premises ERP solutions over a four-year period (the useful life of solution hardware and software without requiring major replacement of solution components). As indicated in Figure 3, the TCO calculation includes several categories and components. Selection of user scenarios. User size scenarios are based on the number of employees who use the solution(s), not on the total number of company employees. Although no one ratio or scenario will ever fit all situations, these user size bands reflect the mid-market focus of this study and are representative of the companies interviewed for this study, with 50-, 100- and 200-user scenarios. These scenarios were selected based on the mid-market focus of both types of solutions (cloud-based and on-premise) and were also representative of the companies interviewed for this study. Application costs. Application costs are based on standard list price per user as published by the vendors, and pricing data provided by customers interviewed for this study. Application solution deployment, integration and training costs. These costs were determined based on discussions with users, value-added resellers (VARs), system integrators (SIs) and vendors, as well as secondary market research. This study evaluates the TCO of NetSuite’s ERP and CRM solution versus that of traditional on- premises offerings. It was designed to compare TCO only. It was not designed to evaluate customer satisfaction with these solutions or to provide a detailed feature-function comparison. For this study, we interviewed a cross-section of SMBs and mid-market enterprises using SaaS- based ERP and CRM solutions from NetSuite, as well as on-premises ERP and CRM solutions from mid-market vendors including Microsoft Dynamics GP, Sage and Infor. Although the solutions we compared differ in terms of the range of functionality, we focused on ERP and CRM solutions and functionality geared toward mid-market companies. Participants in the customer interviews discussed their experiences on condition of anonymity. They described their solution evaluation, selection, deployment and ongoing operational processes, and provided detailed cost information for these phases. As context, they provided qualitative information about the company’s organizational structure, objectives, challenges, experience and satisfaction with solutions, and with VAR, SI or consulting services that they use. We interviewed companies of various sizes to provide a more complete illustration of how some costs included in the TCO comparison change as the number of users changes. The mix included both independent commercial entities and not-for-profit organizations. All of the end users we interviewed indicated a high degree of satisfaction with the ERP solution they chose to deploy. Across the board, companies that replaced disjointed applications and spreadsheet processes with ERP solutions have dramatically streamlined and improved their business and reporting processes. Interviewees reported that solutions have helped improve collaboration, save time and reduce errors. They also indicated that integrated ERP solutions help them make better decisions, and make it easier to meet auditing and regulatory requirements. However, we discovered that the business and delivery models, as well as the cost and pricing structures, for cloud computing and on-premises solution vendors are quite different—and significantly affect TCO. Our analysis found that overall, the TCO for NetSuite’s cloud ERP and CRM solution was considerably less than for similar on-premises solutions—as much as 45% less over four years. For example, Figure 4 shows cumulative yearly total cost comparisons for the 100-user scenario. In the first year, costs for the on-premises solutions are much higher than for the cloud scenario because on-premises solutions require significant upfront capital expenditures for infrastructure hardware and software, ERP and CRM application software, and IT resources to install and configure solution components. As a result, first-year costs for an on-premises solution are roughly three times higher than for NetSuite’s cloud solution in this user scenario. Subsequent years’ costs are also higher due to the high costs of IT resources required to manage and update the infrastructure and applications. Figure 5 compares the total four-year cost of each category for the 100-user scenario. As this chart illustrates, the IT infrastructure costs are the biggest single factor driving the higher TCO of on-premises solutions. Although the total costs of application software and support are roughly two times they enable business innovation, the additional cost of procuring and managing the IT infrastructure is a significant burden for the on-premises scenario—in this model, it is $835,000 over four years, compared to zero for NetSuite’s cloud solution. The overall TCO for NetSuite is considerably less than for on-premises alternatives across all bands of users, ranging from 51% lower to 31% lower. The cost advantages of cloud solutions are significant across all deployment sizes we evaluated, but taper off slightly as the number of users rises. For instance, NetSuite’s TCO is 51% lower than for on-premises CRM solutions for 50-users, and 31% lower for the 200-user scenario. As previously noted, the cost of IT infrastructure is the biggest difference between the models. In all scenarios, IT infrastructure costs for NetSuite are zero because the cloud provider includes this as part of the annual subscription agreement. However, infrastructure costs are significant in the on-premises scenarios, accounting for $544,511 to $1.09 million over the course of four years. When looking at application software costs alone (including annual maintenance), the picture is less optimistic. For the 50-user scenario, NetSuite is almost two times more expensive. For the 200-user case, NetSuite is 2.5 times more expensive. In the Application Implementation and Support category, NetSuite’s SaaS-based delivery is almost 70% less expensive than the on-premises approach in all cases. This is because cloud software does not need to be deployed on-premises, which eliminates numerous issues that inevitably result from company-specific data center environments, and also because cloud solutions are generally less complex to implement. User training is less expensive for NetSuite across all scenarios as well, ranging from $34,160 less to $100,971 less over four years. These scenarios all assume that the client pays for training. The TCO advantages of the cloud model detailed above are just one benefit that cloud customers can realize. These three snapshots of representative NetSuite ERP and business services paint a more complete picture of why SMBs and mid-market enterprises choose cloud solutions, and the types of benefits they can gain. Cover-All Technologies had been struggling to run operations with a non-integrated collection of financial, services, and sales and marketing software and Excel workbooks. The company, which now has 60 employees, selected NetSuite’s solution in 2005. Cover-All wanted an integrated business suite to consolidate and standardize its various business activities, and liked the benefits that the cloud computing model offered. Cover-All hired an implementation manager to oversee the transition to the NetSuite solution. “We needed someone to move the project along, to help us run meetings and keep us on track,” explains CFO Ann Massey. Cover-All ran the NetSuite financial applications in parallel with its legacy systems for about six months before shifting entirely to NetSuite. Cover-All cited several benefits that NetSuite has provided, including real-time management reporting, better project management and improved customer service, according to Massey. “We’ve gotten better marks from our service customers because they can log into NetSuite themselves to see the status of their service request,” she explains. Suter says the company did discuss the issue of data and application security in the cloud. “You always have security concerns,” she says, “but if you deploy a solution internally, you have to have adept IT staff to secure things behind the firewall.” With limited internal IT budget and staff, Calico Energy determined that a cloud solution made the most sense. Just Marketing International (JMI) is a full-service marketing agency for motorsports companies, employing about 120 employees combined in its Indianapolis, IN headquarters and a London office. The company had relied on accounting software packages—Peachtree, QuickBooks and Excel spreadsheets—for data consolidation and reporting. In 2008, a private equity company acquired JMI and determined that it needed a unified financial system with more sophisticated consolidated reporting, and needed to handle the foreign currency requirements of its global clients. The private equity owner hired two consulting firms, which ultimately whittled down the choices to an on-premises Microsoft Dynamics package or the NetSuite OneWorld cloud financial suite. “Both were well liked,” says Greg Nordhoff, JMI’s corporate controller, but the company ultimately went with NetSuite primarily because of its lower costs, including the initial cost of entry. JMI has since deployed OneWorld and a collection of NetSuite modules, including Advanced Financials, Advanced Billing, Advanced Projects and Revenue Recognition. NetSuite has enabled JMI to unify financial processes between its U.S. and U.K. offices. JMI is likely to integrate the Redmap accounts payable document automation software with NetSuite in 2013, Nordhoff says, and, further out, may also integrate Configure One product and services configurator and quoting software as well. “Both of these solutions were leads we got when attending the NetSuite SuiteWorld conference, where both Redmap and Configure One were exhibiting,” he explains. One of the biggest benefits of using NetSuite is getting consistent reporting in both financials and in its projects. “We come up with the same answers, versus getting different answers when we used Excel,” according to Nordhoff. Although cloud computing can provide clear TCO benefits, customers must also evaluate other important factors before selecting a solution. For instance, some companies may need specific features or functionality that are not available in the cloud solution. Or, a company may want to customize the solution at the source code level, which is only possible in the traditional, on-premises software model. Consider your own corporate requirements, and then assess each vendor’s ability to deliver on these requirements. Make sure you understand the differences between a SaaS cloud solution and a hosted solution. SaaS solutions are usually multi-tenant. In SaaS solutions, one database shares multiple end-user customers and they are “partitioned” from each other via a security model in the application, not via separate virtual servers. SaaS solutions can be financially attractive. There are no upfront costs to start using SaaS solutions because they are usually self-provisioning. Multi-tenant applications tend to cost less to maintain and run, and can have a lower monthly cost to customers because of the common database.In the case of a hosted software solution, you (the end user) purchase the software from the software publisher or VAR. You would then have the software installed at a data center or hosting center, where either physical or virtualized servers that you own/lease/finance are set up. You then would implement the solution very much like it would be implemented on- premises, or at your offices. Financially, you would have a large upfront payment for the software, a cost for the software implementation and an additional provisioning fee from the hosting center. Does the contract require an upfront long-term commitment? How easy is it to change the number of users? What penalties or per-user price adjustments are associated with these changes? Does the SLA support an uptime guarantee of at least 99.5%? What security features are supported? What options and penalties does the vendor provide if you terminate the service? For instance, if you terminate the contract, how do you get your data back? Address data security concerns up front. Understand how the cloud vendor stores data, who can access it, and what safeguards the vendor has established to ensure that data is only accessed by authorized personnel. Understand application customization requirements. Most cloud applications are customized via configuration instead of source code customization. For affordable customization of cloud solutions, aim for the 80/20 rule. Can the solution get you at least 80% of what you need, and how much would any necessary customization cost? Customers with very heavy customization requirements may want to consider a packaged software solution to achieve deeper customization. However, they should also consider whether the benefits of this level of customization outweigh the costs. Invest more up front in the evaluation and selection process. Most companies are under- investing when it comes to thoroughly evaluating business solution requirements and options. Seek the help of independent consulting organizations to better understand the total cost of on-demand and customer-premises options as they relate specifically to your company’s unique needs and budgetary constraints. Take advantage of free trials, which enable you to try out the solution before you purchase it to reduce the risks of getting stuck with a solution that isn’t right for your company. Carefully consider the benefits provided by a third-party VAR or SI. Many cloud software vendors offer customers the option of purchasing the solution as well as consulting and support services directly from the vendor, or through VAR or SI partners. In some cases, VAR or SI partners may be a better fit to provide services such as industry-specific customization, integration with existing applications, and migration of data from existing applications than the cloud vendor itself. Demand transparency in pricing. Regardless of what type of solution you are considering, vendors should be able to provide you with clear, transparent pricing information to help you calculate the capital and operating expenses for the solution. Some vendors provide price calculators designed to help you factor in both hard and soft costs to help reduce or eliminate unforeseen expenditures. Consider pricing discounts for multi-year contracts. Several vendors offer discounted pricing for customers who make upfront multi-year commitments and payments. In general, multi-year cloud subscription commitments are likely to yield greater savings in the overall TCO than on-premises multi-year commitments. This is because in the cloud model, the discount applies to everything that is bundled into the subscription price; whereas in the on- premises model, the discount may only apply to annual maintenance fees. Mid-market enterprises have many of the same needs as large enterprises. They need business solutions to help them meet their business goals and challenges, but often lack the IT resources or skills necessary to deploy and manage these solutions. By integrating all of the application software, IT infrastructure and services together in a Web-based, multi-tenant delivery model, cloud vendors can provide customers with economies of scale and skill that are not possible in traditional, on-premises deployments. Although there is no “one size fits all” business solution, cloud solutions merit serious consideration. They enable companies of all sizes to benefit from enterprise-class business solutions without having to incur the costs of an enterprise-class data center, infrastructure, IT expertise and ongoing management. Application and software costs are allowing mid-market enterprises to embrace new innovations from the vendors. In contrast, IT infrastructure costs are just maintenance costs and do not really enable any new innovations from a business solution or business process perspective.